I was called up on my 19th birthday into the Royal Army Medical Corps in Aldershot in December 1941. We did the normal six weeks’ Basic Training in old red-brick Victorian barracks, sleeping on hard army ‘biscuits’ and very damp blankets. The rule was to keep the windows fully open all day, to allow the fog to swirl round our beds, and we only had cold or tepid water to wash in. After the first six weeks we started on our Basic Medical Training – anatomy, First Aid, stretcher drill, bandaging and splinting and the rapid erecting and striking of tents. When I left the Cambridge Military Hospital at Aldershot, I was posted to another hospital at Woolwich, with courses now and then. Later I was posted to a field unit, and so joined the Field Ambulance of 214 Brigade in the 43rd Wessex Division in 1943. The commanding officer of 43 Div, Major-General Ivo Thomas, spared no one from the hardening up process during many uncomfortable winter exercises north of Folkestone – climbing up cliffs, ferrying mock casualties across the River Medway on wet nights, with extra training for RAMC personnel – the testing of water for poisons, the procedures for transfusions and drips, the rapid packing of medical equipment into panniers, and the quick get-away in thirty minutes. During our training in the UK we had an MO who had the foresight to take us to a slaughterhouse. We watched as a big old sow had its throat cut, and we saw arterial blood pumping out and swilling down the drain. It was a daunting experience, but how sensible to expose us to this baptism, for it was a reality we would soon have to confront. Anyone who keeled over got posted! Well, not quite – we had a second chance. These Brigade and Divisional training exercises created great confidence in us, and in reliance on each other. Our morale was high, as indeed it needed to be, for a soldier will fight all the better when he knows that, if wounded, he will be cared for by competent medical hands. Our CO was Lt-Col Lane Murphy. The Chain of Evacuation. The basic structure of forward medical units was the Chain of Evacuation, which ran back from the infantry positions. Field Medical Units were designed to address an old army problem, of how to avoid losing soldiers who were not too badly wounded to the rear echelons, where they could disappear into the bureaucracy of a Base Hospital, as in the First World War. So the aim was to give more treatment in the Forward Areas by categorising wounds so that the treatment selected would enable soldiers to be RTU’d (Returned to Unit) as soon as possible. The Field Ambulance. The basic forward unit is the Field Ambulance, and our job was to give medical cover to the three battalions of our brigade (No 214). These were 7th Bn Somerset Light Infantry, 1st Bn Worcesters and 5th Bn Duke of Cornwall’s Light Infantry. We were part of the 43rd Wessex Division, all from West Country County Regiments. Normally, when not in action, we were under the command of the Medical Directorate, but when in the line we took our orders from Brigade, being directed to which area needed us most. We had a wireless truck and two signallers. Now, a Field Ambulance is not a motor vehicle, but a unit of 10 MOs (Doctors) and about 230 men, about a third of whom would be RASC drivers and mechanics. There would be 22 medical orderlies, 85 stretcher bearers, 2 sergeant pharmacists and a dental officer. His job was to deal with maxillo-facial injuries and to double up as an anaesthetist. The Chain of Medical Posts. This started at the Battalion’s own Regimental Aid Post – the RAP. Behind that would be the Advanced Dressing Station (ADS), which would be 300 yards away or half a mile. It depended on the terrain and the amount of cover you could find. Nearby would be the Field Dressing Station (FDS). Further back again the Casualty Clearing Station (CCS), perhaps five miles away, where most serious operations were done. After that a tented Field Hospital, then a Base Hospital. Battlefield Triage. The battlefield Triage we were taught was a simple mantra – BBB – Breathing, Blood and Bones. If a man was not breathing, you move on. If he was, you then look to his bleeding. You have to respond, that’s what you’re there for, that’s what you’re trained for and that’s what your mates are relying on. He needed reassurance, yet, as Bill Edwards said, ‘You would lie through your teeth time and time again.’ He had to work quickly with his colleague because if his battalion was on the move, he had to keep up with the advance. If a man was badly exposed they would try to move him to some dead ground, to wait other medics following up. They would carry a bag with the tools of their trade – shell dressings, tourniquets, various waddings and slings, simple instruments and powders, and morphia. A great boon at the time was that we had a newish drug called Sulphanilimide, which we used liberally. It was especially valuable in a livestock area like Normandy, where soil contaminated by animal droppings was likely to cause a high level of septicaemia. The oldies amongst us may remember it as M & B 693. It was a great antidote to poisoning. Casualties. These would be brought to the ADS (Advanced Dressing Station) by stretcher, Bren carrier or by Jeep. A Jeep could carry four (two on the bonnet), and with a mounted frame could carry six. We hoped to be sited not too far from the Regimental Aid Post (RAP), as stretcher bearing is heavy work. Men were rested after 4-5 hours. A Field Medical Card would have been pinned to his clothing at the RAP. At the ADS we had two or three trestle tables where casualties were prepared, clothing cut away and so on. They would arrive dusty or muddy, soaking wet or frozen, sobbing and trembling without respite. We gave them hot sweet tea and reassurance. Suffice to say that many arrived with ghastly wounds – still disturbing to remember after 67 years. Around us was the noise of battle. Were we fearful? Yes, we were. Then you learn something important – that the antidote to fear is work. Classification of Wounds. The MOs made the decisions and we medical orderlies worked closely with them, carrying out procedures. Treatment was based not on the severity of the wound, but on the selecting of those most likely to survive. These had priority. Only further emergency treatment was given, and a decision made where the casualty should go next – to the FDS, the Field Surgical Unit, the Resuscitation Unit or the CCS. Documentation. A very important function of all medical units was documentation, for other units down the line would need to know what treatment had been given. Had he been given a transfusion? If we gave a casualty morphia, a large ‘M’ would be marked on his forehead, with the dose given, say a quarter of a grain at 1800 hours. If a tourniquet had been applied, a large ‘T’ would be marked, and the time when it was applied. All casualties received a job of anti-tetanus serum, and treatment recorded on his Field Medical Card. Both German wounded and French civilians were treated. No-one was refused. a) His battalion would need to know where he was. b) His next of kin would need to be informed. c) His injuries would need to be on his Army Record, if later on he decided to apply for a Disability Pension. – The Field Transfusion Unit – a small mobile unit helping with resuscitation. – The Field Surgical Unit was another. This unit would often make plaster casts to stabilise the movement of fractures, which was very helpful in reducing pain. Journeys in a jolting vehicle were always of great concern. They were originally supplied with ether, which was dangerous. Later they were supplied with nitrous oxide, equally dangerous, as the bottles would explode if hit. So they were dug in. The Casualty Sweep. Another important function of a Field Ambulance was the Casualty Sweep, by which I mean the following up behind a battalion to locate wounded men. There is an urgent need to observe and remember where men fell. Now each stretcher bearer is allotted a group of infantrymen to follow, without losing eye contact if he can. It is very easy to miss a casualty, and not difficult to lose sight of a whole battalion on the move, especially in close country like the Normandy bocage. We allow 100 yards between each man, and closer if it was dark. One’s job was to follow the advancing infantry until the objective was taken, report positions to your NCO or officer. If possible you would move a casualty to where he would be discovered. Buildings needed very careful searching. If he is concealed, leave a marker of some sort, such as an upturned rifle, or tie a piece of bandage to a bush, to reassure him. There are considerable difficulties here: there is a need not to betray the man’s position to the enemy, so move him to dead ground if possible. It is not always possible to evacuate him quickly. You may have to wait for darkness before it would be safe to stretcher him back. The wounded soldier is in a predicament. He needs to guard against loss of blood, he may be frightened, or at least not in a fit state to remember his training. If he cannot walk, he will need to attract attention to himself without attracting the attention of the enemy, and as his mates pass him he will feel totally abandoned. Whilst an infantry battalion has twenty stretcher bearers of its own, a tank regiment has none. So in this situation the RMO would scour the battlefield in his half-track, and seek help from other medics. It is very difficult to extract a man from a tank, so tanks carried phials of chloroform. This would be poured onto a swab of cotton to give the chap six pennyworth of oblivion while being extricated. In treating burns, tannic acid jelly was of great value, as it relieved pain and formed a protective coating, and prevented loss of fluid. It also prevented toxins from damaging tissue entering the blood stream, which was the usual cause of death from burns. There were very few cases of gangrene, but MOs did have small amounts of penicillin. It was scarce, and not allowed on German wounded without permission from the Brigadier. Both these medicaments could be applied to open wounds. When opened later, the wounds were nearly always clean. It is necessary to insulate yourself from the agony of war. You must be professional: you must be free of pity. This is not the same as being hard. Shellshock. It was called shellshock in the First World War, but we called it battle fatigue in the Second World War, and is the same as exhaustion. Now we call it something else – post traumatic stress syndrome. In February 1944 the army had set up a very small network of psychiatrists – there was one per corps – 20,000 men – and one for each General Hospital, and this small cadre gave training to our MOs. Casualties would arrive weeping and jittery, unwashed and unshaven, dishevelled and dusty. Some were apathetic, some were noisy. They would start like hares at the least noise. Some sat and shook, almost too scared to move, some wanted to dart off to a more substantial shelter than mere canvas could offer. Mild sedatives, warm drinks, a clean bed and sleep were prescribed. A period of sedation, and the complete rest it induced brought wonderful changes to many, but not all. There was no shame in the condition either. A man could be a very good soldier for months, then suddenly crack. Later in the campaign it was realised that the period of sedation and rest was more effective when carried out within the sound of gunfire. Men recovered sooner than if they had been sent back to a tented hospital – an important observation. Stretcher bearer drill. There’s more to it than you think! The normal carry is with four bearers on the shoulders; so shoulders need to be sized off. Number 1 of a squad is always responsible for the welfare of the casualty. A Mark 2 stretcher weighed 30 lbs and a man, say 150 lbs. When carried on the shoulders the man would be carried head first. When carried by hand the feet would be forward. On hilly ground head injuries were carried head first up a hill, then you turn round with feet first down a hill. With lower limb injuries it would be the other way round. To keep the casualty level and as comfortable as possible, a four-man carry would all step off with the inner foot. With a two-man carry the front bearer steps off with his left foot, the rear bearer with his right foot, i.e. out of step. You go round a wall or fence if possible and not over it. Find a gap, otherwise it is difficult to keep the chap level. It is very hard work, and more so if you have to crawl. Stretcher bearers were rested after 4-5 hours. Army Padres. In 43 Div they were remarkable chaps, quite marvellous at maintaining morale on the one hand, combined with the grisly job of picking up body parts and re-assembling them in a blanket for burial. They often worked alone by choice. Help offered by the infantry was usually refused by the padres, on the grounds that the less fighting men see about this side of things the better. They know it happens, but to force it on their attention is not on. I remember a padre saying to me, ‘Every man in a slit trench is a Christian.’ I have a photograph in a book of 16 padres with the Chaplain General taken in Normandy on 28 July 1944. Within the next ten days 3 of them were killed. Burials. The job of digging shallow graves and marking them was the responsibility of the sergeant major and a party from Battalion HQ. Every soldier wore round his neck two identity discs. They were made of vulcanised fibre, so they would not rot, nor be destroyed by fire. They were embossed with your name, army number and religion. The green disc was buried with the body, and was usually put in the mouth, where it was easily found and checked before a proper burial later. The red disc was retrieved and went with the man’s records. Now I’m going to change tack and tell you about our last days before embarkation for Normandy. We of the Field Ambulance moved to a camp of brown canvas bell tents, in a beautiful setting of parkland. We saw great oaks in lush pastures, grazing cattle and sheep on the chalk downs, and I thought how glorious is the English countryside. The camp was sealed within a perimeter wire fence, with a sprinkling of Military Police patrolling outside. Here we camped with other troops of 43 Div. It was not until many years later that I learned the camp had been in Glyndebourne Park – we did not know of its significance then, as the home of English opera. After a few days we embarked on LCIs at Newhaven, and sailed with five others in line astern for two miles out to sea, then stopped. The vessels did a careful ninety degree turn to west, and then sailed along the Sussex coast on a summer evening to join a larger force at Spithead, and now with Royal Navy escorts. We had an American crew, and our rations improved dramatically. I recall opening one tin which contained, of all things, a delicious Christmas pudding. The sense of unreality of this absurd situation – eating Christmas pudding in the darkness on a summer night, whilst crossing the Channel on the way to war – has remained with me. We had Tommy cookers, with hexamine fuel tablets, and waxed cardboard boxes of compo rations to last us several days. At the bottom were a few boiled sweets, and very thoughtfully, six sheets of lavatory paper. Each sheet had a rough and a smooth side. My friend, John Majendie, said he thought the smooth side must be for the officers. We came ashore at Arromanches with the 4th Battalion of the Somerset Light Infantry, and were issued with tins of self-heating soup. These had a carbide core, which you ignited, but of course you had to puncture the can first. Inevitably there was always some lemon who failed to do this, or he’d remembered too late, when we’d be amazed to see rising up a thin eight foot column. It was just like the Indian rope trick being done in tomato soup. We marched inland to the village of Ryes, where we left the 4th Battalion, and marched on seven miles to Courseulles where we rejoined our transport and moved to Brecy, to our Concentration Area. The Normandy countryside was lovely, a great delight to me, but I was bothered by the incongruity of it all, by the despoliation of it, by our trucks and half-tracks churning up the verges, polluting the air with noise and petrol fumes. The contrast between these two sides of life seemed so crude, and fundamentally wrong. Soon we came to buildings scarred by gunfire, burnt out tanks, some dead unburied bodies, others in shallow graves with a rough cross, and with a name you will remember all your life. And dead cattle, with gas-bloated bellies, legs stiffly pointing towards the skies, a church steeple, wrecked by shell fire. The initiation into battle is an event one does not forget, for in spite of our training we became apprehensive and quiet. One wonders how one will react, indeed how one will behave, because you don’t really know. We were about to join Operation EPSOM, where our own division, 43rd Wessex, was to advance, a little behind the 15th Scottish Division on our left, with 49th West Riding Division on our right. We took up first positions at St Manvieux, but were then ordered to another village two miles away at Cheux. The Field Ambulance was given a map reference half a mile north on the 100 metre contour line, where we dug slit trenches, but remained on wheels, that is we didn’t open up. Next day we set up a CCP (Casualty Collecting Post) and an ADS (Advanced Dressing Station). Some enemy armour broke through and we were ordered to move PDQ to a new position, as we would have been hampering the manoeuvres of our own tanks. I remember the early casualties, especially the first, because of all things the poor chap was diagnosed with appendicitis. 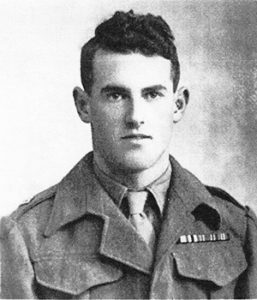 The next one was our own 2 i/c, Major Menzies, who was brought in with wounds to both legs – from mortar fire. We did not see him again. The third chap was a case of blast injury. He died almost immediately. Some days there would only be a trickle of casualties; at other times we would be overwhelmed. One is too engaged to be aware of passing troops or gunfire. During Operation JUPITER we dealt with 350 casualties in the first 36 hours. We lived on tea and cigarettes until we dropped. Then an MO would give you a dose of Benzedrine and you’d carry on for another four hours. Our losses were grievous and seemed unbelievable. The 4th Somersets had sixty per cent casualties, that’s 525 men, whilst the 5th Duke of Cornwall’s Light Infantry (DCLI) suffered ninety per cent – yes, only fifty men filtered back from the last attack. The battle lasted 32 days. We never took the wood which crowns Hill 112. Nobody won it. The Germans just slowly withdrew. It was almost the only defeat of the 5th DCLI. This was the cost of freedom which the present generation enjoys. The French, the Belgians and the Dutch know it, for it is inculcated into their children. It saddens me to realise that today the young of Great Britain know very little about the real cost of freedom, or how it is earned. Here are some random memories from Normandy. In the early days, when in our slit trenches, a very old woman came slowly towards us with a basket. She had brought us a cooked chicken, out of thankfulness for the liberation of her village – very touching. When she left us we discovered she had stuffed it with prunes! All she had! I was surprised at seeing in the windows of a small shop a packet of Persil and Mazawatee Tea, which I’d always thought were exclusive to England. How odd, I thought –what a sauce! Private Jack Eglington of the 4th Somerset Light Infantry was standing beside a Bren gun carrier, talking to two chaps on the other side, when a solid shot from a German 88mm tank went between his legs, knocked over the carrier and killed the two chaps on the other side. Another memory is of the driver of a rations truck remarking, ‘War is a funny business – you’re here today and gone tomorrow.’ As he left the gate in the field, a shell burst caught his truck, and he was no more. On 23 July we left the Odon valley and went back to the village of St Manvieux. Soon afterwards 43 Div was withdrawn to a rest area about two miles away on the river Seuilles. The RAOC fixed up a settlement where we had mobile baths, a complete change of clothing, a canteen and films – Roy Rogers and Charlie Chaplin. After four days the Division moved south to Caumont to continue the advance through Livry and Briquessard. When the war in Europe came to an end in May 1945, 43 Div had reached Bremen. We did not celebrate much. Ultimately we went home and forgot about the war for the next fifty years. Reproduced with the author’s permission from Peter Walker’s unpublished memoir ‘A Medic in Normandy’. Copyright Peter Walker 2013.